Log in to Service Analytics from your mobile device. Get key insights from your phone using the app’s mobile dashboards. Kick off actions right from your phone to keep your team moving in the right direction. You remember that answers are right inside Analytics on your mobile phone. As you rub the sleep from your eyes, you think of some of the questions Service Analytics might answer to help you support the tablet launch. What’s happening with tablet service cases? Are we seeing many cases? How quickly are they being resolved? What impact are these cases having on customer satisfaction? With those questions in mind, you open mobile Service Analytics. Connect to your new Developer Edition org to access Service Analytics. Tap the icon in the top left corner to open the account screen. Analytics opens to the home screen. Tap My First Service App to open your app. You should see a list of dashboards, with the About Service Wave dashboard at or near the top. Before you’re even out of bed, you’re reviewing your service business. You start with a look at the significant picture, then dig in from there to see what’s happening with tablet service cases. Data and some of the elements in your dashboards might look different from the examples here and elsewhere in the Service Analytics module. The steps we take you through still apply, regardless of the dashboard details. Tap About Service Analytics to open the overview dashboard. 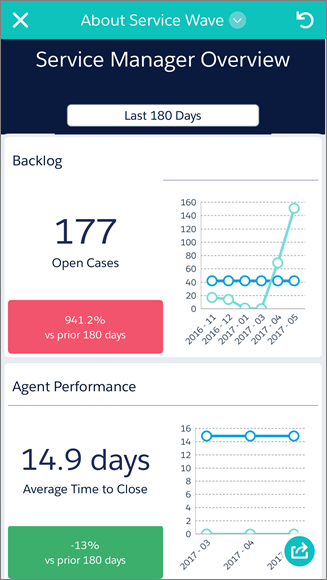 That’s the top of the dashboard, showing the backlog and average time to close for your agents. Scroll down to see the rest—percent of cases closed on first contact, average CSAT ratings, and links to all the other dashboards. It’s everything you just looked at in the desktop version of the app in a layout for a mobile device, with the same time period filter at the top. Nice to see all that, but you’re interested in what’s happening with tablets, so filter the backlog for tablets cases. Tap Prioritize Open Cases to get to the Open Cases dashboard. Scroll down to the By Product Family widget. Review the options for filtering the backlog according to product. Tap the Tablets bar. 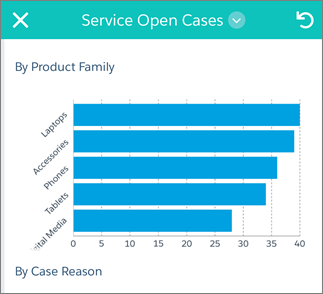 The Open Cases dashboard redraws with only cases involving tablets, showing you the number in a bar over the Product Family widget. (If it doesn’t do that the first try, tap again.) It doesn’t look too bad. What else can you find out about the tablets cases? Scroll down to get to charts with details. 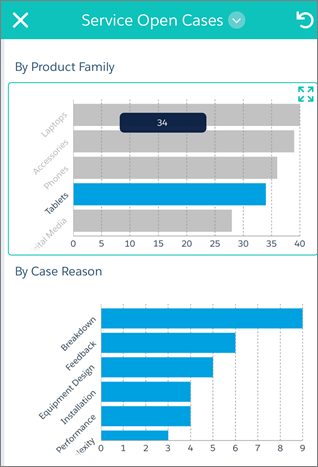 One of them, By Case Reason, shows you that Breakdown is the main reason for tablet cases. You write yourself a note to remind the team to look up knowledge articles about fixes for breakdowns. That way, they’ll have the expertise to help them solve cases quickly. Keep scrolling to see the Case Details table. You’re impressed. So much detail, right from your phone! You can stay on top of your team and their cases anywhere, anytime. It’s almost time to get to work. But before you get going, take a closer look at the last section of the Open Cases dashboard with case details. On your phone, tap the Cases Details chart. The arrows icon appears in the lower left. Tap it to explore the chart. Swipe to see all the columns in the table. You especially want to learn more about cases that took a long time to resolve, and your open cases. Swipe to the right to see the Avg of Duration column and scroll down the chart to find the case with the longest duration time. Now swipe back to the left to find the owner of the case under Agent. Looking further to the right, you can see that the status of the case is Working, meaning it’s still open. Wouldn’t it be great if you could get right in touch with the case owner to find out what’s going on? Service Analytics gives you a great way to do that by taking action right from the dashboard. Cool! Tap the actions button in the lower right. Then tap Share Snapshot, and then Salesforce. This opens a window that lets you annotate the chart. You could have typed a note for the case owner, such as “Hi! 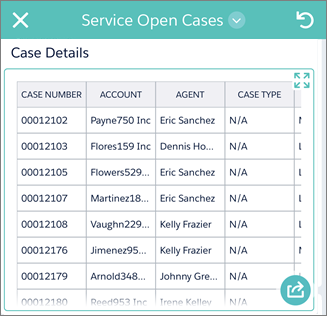 Can you quickly sum up what’s taking so long with this case?” You can see how you can use Salesforce actions to get an old case moving. Analytics for mobile rocks! You’ve learned that the main reason for tablet support cases is breakdowns, and you’re going to prompt your team to discover more about how to address those issues. And you’ve taken the first action to learning even more from your team. You can’t wait to get there to see what more you can get out of Service Analytics!